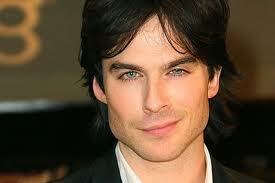 Do you whatch the vampier diarys well if you do you probley know who Ian Somerhalder is learn more about him here. Ian Somerhalder was born on dec, 8th 1978 . And his age is 34. Does he have brothers or sisters? Ian has only two siblings he is the middle and his sisters name is Robyn and his brothers name is Bob. Is Ian married and to who? No Ian is not married but he did propose to nina but she said no.